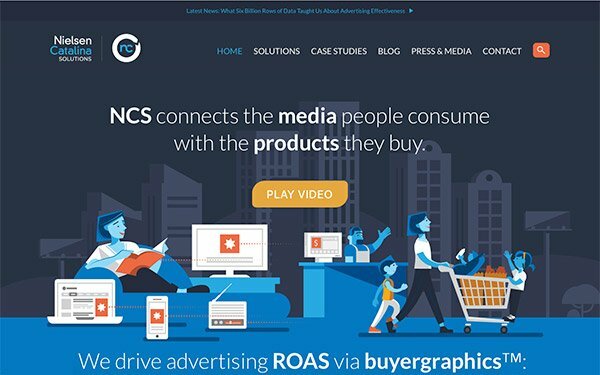 Nielsen Catalina Solutions, the joint venture of Nielsen and Catalina that specializes in data and measurement relevant to the CPG industry, says it has expanded its Advanced TV Suite to include purchase-based ad targeting. The new capability will work alongside the suite’s existing capabilities, which track sales measurement. The suite allows CPG marketers to measure data-driven linear TV, addressable TV, over-the-top (OTT) video, and connected TV (CTV). “Not only does this new capability simplify the targeting process for advertisers and agencies, but it also expands the availability of media inventory on the TV screen that can be targeted at the household-level to platforms across the ecosystem, including Hulu, Roku and SlingTV, reaching the elusive cord-cutter and cord-never audiences with digital-like precision,” the companies stated. Advertisers can target their audience based on in-store purchases, on whatever screen or platform they choose. For example, a CPG company could find lapsed customers — customers who previously bought their products but haven’t recently — and target them specifically. 3 comments about "Nielsen Catalina Solutions Expands Advanced TV Suite". Ed Papazian from Media Dynamics Inc, October 8, 2018 at 6:54 p.m.
As usual the words "household" and "audience" or "consumers" are used interchangably, yet the actual measurements are mainly set usage based for "audience" and even though there are good things to say about this facility---it certainly is a step forward---- it is not measuring whether individual consumers are actually being exposed to ads for "linear TV" which constitutes the bulk of the ad "impressions" for many advertisers. I hope that this flaw will eventually be dealt with as it muddies the analysis and may actually cause an understatement of ad impact as it applies to specific viewers. It's much easier to "reach" a household, where anyone who turns on a device credits the home with "viewing"----but it's much less likely that the human decision-maker--or makers---is the one who is watching. John Grono from GAP Research, October 8, 2018 at 8:52 p.m.
Ed, I don't think this is as blunt an instrument as many people suspect it is. Inside a household family unit, the CPG shopping is often shared. In the old days 'mum' did the shopping, and generally once a week. Now the grocery shop is fragmented with various household members doing 'convenience' shops for the essentials, but there tends to still be a big 'weekly shop'. In a household family unit, a common shopping list still prevails. So as long as someone in the household is targeted it is less important that we know which individual - as long as they add the product to the shopping list. So in a household with two teen kids, you can put a cosmetics ad into a young female skew programme and an e-sports ad into a young make skew programme and it will work its socks off ... all withou knowing exactly who - as long as you target the right household composition and the right programming with a strong ad. Ed Papazian from Media Dynamics Inc, October 9, 2018 at 5:45 a.m.
John, the problem with using set usage as a surrogate for viewing is aptly demonstrated by this set of facts. According to set usage tallies TV's most frequent viewers are young adults with lots of children and affluent adults. According to viewer studies TV's lightest viewers are those very same people. Why the difference? Younger/afluent homes contain many more people than the norm---any of whom can create the impression that the household has been "reached" by turning on a TV set. But the average young adult and afluent adult, specifically, watches much less TV. It's often someone else---a kid, teen, visitor, pet, etc. that is watching, not the person who is assumed to be viewing. As a result, you have a built in error margin that tells you that a young/afluent adult appealing show is where to place your ad when, in reality some other show, despite a significantly lower index----per your profiling specs---is actually the better choice.